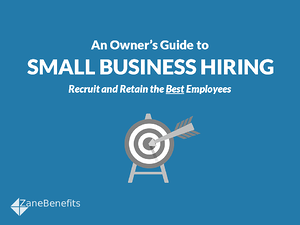 Zane Benefits, which provides small businesses with simple and friendly healthcare solutions, announced today the publication of a new eBook “An Owner's Guide to Small Business Hiring.” The guide helps small business owners recruit and retain the best employees. Small businesses are powered by their employees, and the U.S. economy is powered by small businesses. According to the Small Business Administration, small and medium businesses (with fewer than 200 employees) represent 81% of all U.S. companies, account for half of all jobs, and contribute to 65% of new job creation. And yet, finding, hiring, and retaining top-performing employees is a challenge for small business owners with limited time and resources. According to the new eBook, small business owners need to be smart about recruiting new talent and make each new hire count. Successful hiring also extends beyond offering a candidate the job. Small businesses need to consider employee onboarding, manage performance, and evaluate compensation and health benefits to retain the best employees. Whether a small business is hiring their first employee, or their 50th, the new guide provides practical tips and tools for small business owners to recruit, hire, and retain the best employees.